You know what I mean, that impression that you know the perfect project for THAT fabric. This piece came together seamlessly (pun not intended) I knew exactly what I wanted to do and how to do it. What perfect quilting was needed. It is a wonderful feeling that I wish I would have more often. Gorgeous quilt! I noticed that we were adding our links at the same time, so I had to come over and check out this beauty! You really captured the character and detail of your peacock. Beautiful! That marbled fabric works wonderfully! 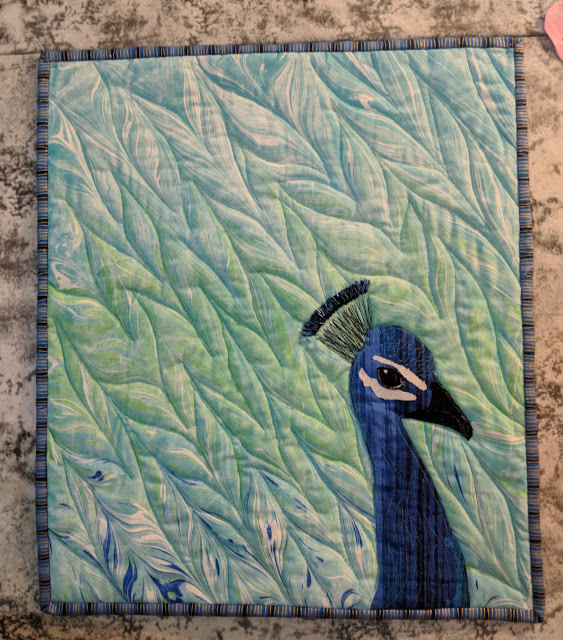 I love the quilting design you chose! Very complimentary to the quilt. Whoa! The peacock was a great choice for that fabric! You are right - it was perfect for a peacock. I can see why you had to stop everything and quilt it. It certainly IS a wonderful feeling that dreamy DrEAMi! You've got it perfectly, both in the intent of a Drop Everything And Make it! project and in the final finished gorgeous project! I love the peacock head only in the corner, so unusual and so right. As is the quilting! Thanks for linking this up Yanicka!